Tag Archives for " Paxten "
I met him in the playroom at Mission Hospital in May of 2007. My son was at Mission due to complications from pneumonia. Paxten was there for chemo. Or something . . .
Paxten and I soon became friends. He was frequently in the hospital and I would visit him on Wednesday nights while my children were at church. I'd have around 45 minutes to hang out with him. We played with stickers and playdoh, talked about Ben Ten and Spiderman, and played with his toys, navigating iv tubing and hospital bed limitations. He learned early on that I had to leave at a certain time and as that time drew near, he would distract me from looking at the big clock on the wall. We laughed at his shenanigans, he begged me to stay longer next time, I promised I'd try. Not quite a year later, his hospital days were over forever. 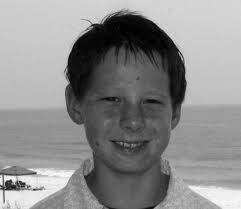 Today marks eight years since my little friend Paxten Andrew Mitchell passed from this life to the next. He was 3 years and 7 months old. Paxten's dad once told me, "They could find a cure to pediatric cancers, but there isn't enough research done. That's partly because no one wants to talk about kids getting cancer. The thing is, though, that if they would talk about it, awareness would increase. When awareness increases, so does funding for research. When research increases, cures are found." Research. It really is the solution to the unthinkable. There are lots of ways you can be a part of that solution. Two great charities I recommend are Saint Baldricks and Cure. Both of these organizations work to fund research and to provide cutting edge equipment to pediatric oncologists. Check them out. Every contribution matters. If you can't contribute financially, there are other ways you can make a difference. Talk about children with cancer (by far the majority survive and live full lives). Remember, cancer is not contagious. Our kids won't catch it just because we talk about it. And hey! Just by reading this post, you've increased your awareness. Share it with friends, and you've multiplied that awareness. What other ways might we join in the effort to find a cure for pediatric cancer? Because a cure must be found. The alternative . . . well . . . it's unthinkable. I’ve felt like this, have you? It’s a horrible, desperate feeling. But I’m not alone in having felt this way. 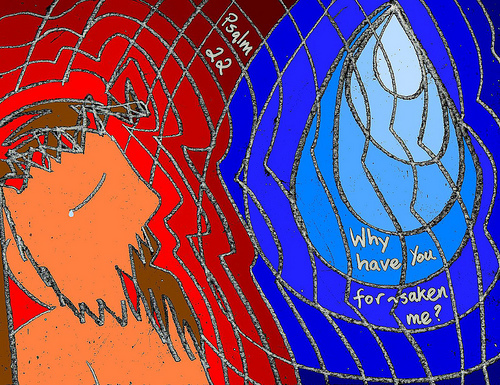 In fact, this cry, “My God, My God, Why have you forsaken me?” should sound familiar to the New Testament church. We heard it from the voice of Jesus at his crucifixion. We hear it again at our Good Friday services. And we Baptists may only faintly remember that part of the story as historically we rush past the cross straight to the resurrection. It’s important, though, to hear Jesus cry out, lonely and abandoned. Jesus was, after all, not only fully divine. He was fully human, just like the psalmist. Just like you. Just like me. Of course, that’s partly true: certainly God has not forsaken us, and indeed, it is our own humanness that makes us feel forsaken. But God made us human, so we can’t be all bad. Rather, I think it is our focus on our humanness that creates the problem. I’ve been there. Some mornings, my husband greets me with, “Good morning. How are you feeling this morning?” Too often I respond, “UGGH! I’m consumed with self-loathing, how about you?” My response is my attempt at humor to deal with the difficulty I have of coping with my humanness. Sometimes, I feel like a worm. And all I can think about is my worminess. The psalmist felt like that too. Take a look at verses 6 and 7: But I am a worm, and not human; scorned by others, and despised by the people. All who see me mock me; they make mouths at me, they shake their heads;” The Hebrew word for “worm” here means the same as our English word “maggot.” And look, the psalmist’s maggot-like feeling is only reinforced by his not-so-loving acquaintances. What an animated picture of a taunting crowd: snarling, angry, face-contorting busy-bodies. Poor psalmist—he already feels abandoned; then his neighbors go and make it worse for him. I think he’s right: I know I can’t live this life alone. I can’t do it alone because there are too many difficult circumstances in my life that divert me from my true purpose of glorifying God. Plus, the minute I mention that I can’t do it alone, I find myself distracted by me again. And then all the things that worry me fill my mind, and I somehow lose sight of God as I try to figure out how to manage all my problems. What would be on your list of worries? Your boss and her lack of integrity or your co-workers cheating on their expense accounts and the pressure they put on you to do the same? Your career that’s going nowhere or your career that has not yet begun? The fear that you’ll lose your job or the fear that you are stuck in this one forever? Would you think about how much you want another cigarette, drink, or piece of cheesecake—because that always makes it better, always. Maybe you struggle with depression. Maybe you’re lonely--in a new town or neighborhood, in your marriage, or maybe you’re lonely and for the life of you—you don’t know why. Or perhaps you are battling a life altering or even life threatening illness. Maybe someone you love is. Maybe you have lost loved ones and you can’t imagine facing another day without them. Our parents are getting older, our siblings don’t get along, gas prices are going up and the commute just keeps getting longer. Our kids get sick, get in trouble, get behind and get confused. Sometimes it feels as if we are being pulled apart by troubles. Don’t you just want to scream? The psalmist did. He cried out to God. I think it sounded something like this. And in that moment, when the psalmist cried out, naked with need, aware that nothing in his power could save him, everything changed. The psalmist stopped focusing on circumstances, and started focusing on God. Now here’s the thing. I don’t know if the psalmist really meant what he said when he started praising God. Maybe—we’ll never know for sure, but maybe—he really didn’t mean it. Think about it. Have you ever smiled when you didn’t mean it but then found that before long you felt happy anyway? Have you ever laughed when you didn’t feel like it then kept laughing until you did feel like it? Maybe, when we don’t feel like praising God, maybe we should praise God anyway. You know, praise God until we do mean it. When we are faced with suffering that surpasses our limits, sometimes praising God is the only answer. It helps to say it aloud—to tell people that we believe in God, that we are in awe of God's love. It helps to say how God has blessed us in the past, and to proclaim God's goodness to our loved ones. Whatever caused the psalmist to start praising God, what resulted from his praise is remarkable. Depression redesigned as delight. Trauma transformed into triumph. Extraordinary. Never in Psalm 22 does God answer the question. When the same question is asked from the cross, no answer comes. Yet Psalm 22 ends in joy, and the crucifixion resulted in the resurrection. The problem then, or at least one of them, is how do we move from the question to the joy? How do we get from the crucifixion to the resurrection? It seems like one way is to keep talking to—or screaming at—God. (I think God can handle it when we get mad at him and wrongly accuse him. We may not fare so well, but God manages just fine, I think.) And somehow, we are transformed. We move out of the pain and into the praise. We go from raging to rejoicing. I don’t understand it; but it happened to the writer of Psalm 22. And It happened to Jesus. “Praise him, you servants of theLord! *This piece is a portion of my very first sermon. I wrote it in Spring 2010 for Intro to Preaching class with Dr. Danny West at Gardner-Webb University, M. Christopher White Divinity School. Paxten loved them both. He loved scary-looking figurines with spiky skin and buggy eyes. He loved Spiderman and his wall-climbing, crime-fighting expertise. And he loved firefighters too. (Especially the one he called "Daddy.") Yep, Paxten was 100% 3 year old boy--right up to the day he died five years ago from a monster named cancer that all the superhero doctors combined just could not defeat. He would have been a third grader this year. I sure do miss that little guy. You can’t miss it. If you travel that road, you will see it. Looming over the highway for all motorists to see: a billboard-sized picture of a mangled motorcycle with the ominous declaration “Death is forever.” Every time I pass it, I get the message; I never intend to read it, it is just that prominent, that unavoidable. That . . . gripping. And every time I see that sign three faces rush to my mind: faces that are forever never-changing. Paxten, always 3 years and 7 months old—even after his younger sister turns four and then five. Matthew, staying 12 while his twin rushes into high school. Caleb, forever 11: his younger brothers eventually matriculating to grades he never got to start. And I just wonder: How can you face forever when your boy is gone? How can you imagine a future without your child, your parents, your beloved? I gotta tell you, I wouldn’t want to face tomorrow without my beagle, much less my people, and I’m not kidding, not even a little bit. Death is forever. And it hurts. It hurts on the big days (the ones you know will be hard): the anniversaries, the birthdays, the holidays. But it hurts on the little days too: when the family gathers and one is forever absent, when you go to the restaurant that will forever be her restaurant or his, when you go to the ball field, the bookstore, the band concert. Everywhere. Always. Forever. I hurt so much for loved ones who are bereaved; my heart screams about fairness and longing. Yet if I hurt for them this much what must it be like for the childless mother, the lonely widow, the grieving child. I can’t bear even the thought of it. And that’s because, well, it can’t be borne—not by human hearts anyway. At that thought, my soul stretches out, finding hope within reach. Because for me, on account of my faith, while I know death is forever, I also know life is eternal. I can rest in that assurance. So, I slip my hand into the nail-scarred hand and fall deep into Christ’s embrace. There, I feel the tears of Jesus mixing with my own. There I am reminded that even when I walk through valleys that are permanently shadowed by death, I do not walk alone. And somehow, because Jesus lives, I really can face tomorrow. Forever. The letters were right there in colored chalk. “C-A-T means this.” My sister stood beside her chalkboard, pointing to a picture she had drawn of a cat. And in that moment, I got it. Colors looked brighter, music sounded sweeter. Falling in love with Jay Lawrimore had me saying all the sappy things I’d groaned at previously. In the end, she didn’t know any of us. No matter: loving Grandmama for better or worse gave me sweet joy and made me a better me. Nothing. Nothing prepared me (has prepared me yet) for the joy of it. He was only 3 years and 7 months old when he died on April 6 2008. I still wish the truth were a lie--I wish that Paxten still lived on, growing bigger, getting stronger. I do not want it to be true that he's gone. Yet while losing him hurt like nothing I'd experienced before, it was loving him that changed me: Love fast, Live now, Laugh anyway, Linger a little longer. I loved loving Paxten. I love him still. On April 6, 2008, Paxten Andrew Mitchell slipped from his parents embrace into the gates of heaven. This time last year, no one was talking about Paxten getting well. He was home, with his family, with hospice. I miss him. When Paxten was still well enough to be in the hospital, I visited him about once a week. I’d come bringing fresh Playdoh® or new dinosaur stickers. (I still catch myself looking for stickers or checking for a bargain on Playdoh® before I realize my reason for buying those things is no more.) Paxten and I would stick the stickers all over ourselves and anything else we could find; we’d sculpt new creatures with the Playdoh®. Actually I would sculpt, or Amy would, as Paxten directed our efforts. We made funny faces. We wrestled—careful not to disconnect IV cords as we played. And we laughed. We laughed a lot, Paxten & I. Eventually though, I’d have to go home to my children, often leaving Amy by herself with her boy. In the hospital bed (it seemed huge when Paxten was in it alone), Amy slept with her boy curled into her. No doubt she did all night what she did all day—checked his temperature with her mommy hands and diagnostic kisses, glanced up at the monitors to see if everything was normal (that is, as normal as it ever got for Paxten), and readjusted his tubing so he was not lying on it. . . When Paxten stirred during those long nights, I bet he had the same conversation with his mother that he had several times every hour during the day. Since I published this seven years ago, Caleb Spady slipped from his earthly father's arms into the embrace of his Heavenly Father. He passed away 15 months after his diagnosis on July 21, 2009. Many others have been diagnosed with DIPG since then. It is a cruel and horrible disease. But there is good news. Research is being done; treatments are being perfected. 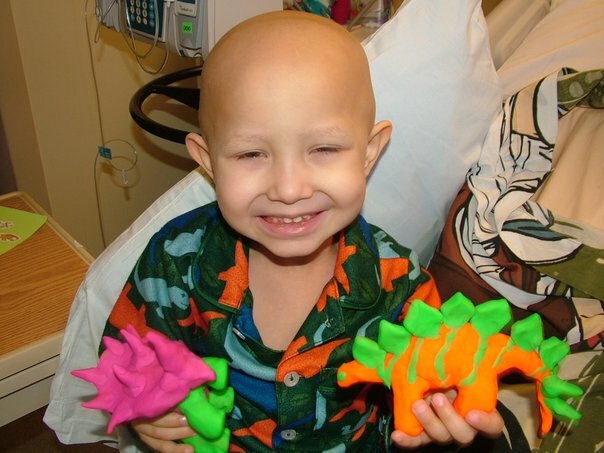 Because people are becoming more aware, more funding is available for all pediatric cancers. Don't be afraid to learn about pediatric cancer. Awareness doesn't lead to cancer diagnoses. Awareness leads to hope. Knowledge. It really is a good thing. September is Childhood Cancer Awareness month. Each year, Chili's holds a Donate-The-Profits day to benefit St. Jude's research hospital. This year, that day is Monday, September 14, 2015. Find a Chili's that day and eat up! Just by doing that, you'll be making a difference in the life a child. Five months ago, at a huge party to celebrate a life that we already knew would be way too short, Paxten Andrew Mitchell gave me a big hug and a kiss. As he fell into my embrace, I rubbed his fuzzy head, feeling hair there for the first time in our year-long friendship. Later Paxten wrestled me to the floor and stood triumphantly above me giggling at my weakness. In less than a month, Paxten’s fight against cancer ended at Heaven’s gate. Now my friend Kim Spady is fighting for the life of her son Caleb, a vibrant ten year old boy with a ticking bomb in his brain called a Diffused Intrinsic Pontine Glioma (DIPG). Surely we can all do something to stop these random pediatric cancers from ripping open our hearts and tearing out our children. Kim believes, and I know she is right, that the first step is awareness. Would you visit one of these links and become a little more aware? You don’t have to become an expert. Just learn one thing. You don’t have to spend your whole night on the internet (Kim’s already doing that). Just learn a little bit. I’ll never get another hug from Paxten on this side of Glory, but one way I can honor the gift God gave me in Paxten, is to spread the word about pediatric cancers.